Enclosed master suite with king-size bed, TV/DVD, and full bathroom with walk-in shower. Outside the master suite, a hide-a-bed couch nestled in front of a gas fireplace. Two guest rooms with queen-size beds, and separate full bath. The living room's high ceilings expose beams, soaring windows with mountain views, a stone gas fireplace, TV/DVD, and card table for 4. Off the living room is a fully-equipped gourmet kitchen with stainless fridge, regular sink, prep sink, 6-burner stove with 1.5 ovens, bread warmer, microwave, and dishwasher. Off the kitchen is a mud room with washer, dryer, utility sink, enclosed toilet, and large chest freezer. The dining room houses a buffet, seating for 8+, and small bar with seating for 4. The back deck off the dining room/kitchen houses a hot tub with mountain views and a propane BBQ. Two guest rooms with queen-size beds, and separate full bath. One guest room also has a set of single bunks. The living area has hide-a-bed couch in front of a TV/DVD. A small gym is also located in this area. On the other side of the stairwell is a game room with pool table, foosball, air hockey, and bar with prep sink. There is a fire pit for your use outside the lodge (please check with us on current burn bans or restrictions, also we do not supply firewood/starters). During summer, access to Lake Kachess Campground is a few miles down the road with a beach and boat launch (fees apply). Hiking trails are plentiful -- check out Rachel/Rampart Lakes, Snow Lake, Kendall Catwalk, Silver Mountain, Granite Mountain Lookout, Bandera Mountain, and Gold Creek Park to name a few. Forest service roads right off the property are great for hiking, driving, picnics, snowshoeing, and snowmobiling. During winter, the forest service roads connect to miles of groomed snowmobile trails on Kachess Ridge. We have plenty of parking in the lower lot for snowmobile trailers, but we do not rent snowmobiles. Also in winter time, designated cross-country skiing trails are maintained across the street (fees apply). Sheets, bath towels, hot tub towels, kitchen towels, dish cloths, 6 rolls of toilet paper, one roll of paper towels, hand soap, dish soap, dish detergent, laundry detergent, iron and ironing board. We also supply pots, pans, plates, silverware, glassware, and cookware. Also wireless internet, but it is a little slow out here in the forest. Bottled water, food and drinks (don't forget staples like olive oil, salt and pepper, seasonings, etc. ), clothes, shampoo, conditioner, body wash, toiletries, extra toilet paper & paper towels, foil, seran wrap, ziploc bags, food storage containers, beach towels, sunglasses, cameras, games, DVDs, electronics, phones, chargers, and firewood. The managers live onsite in separate quarters over the detached garage. They are there for cabin maintenance only, especially between guests but sometimes during a guest stay when necessary. They enjoy meeting guests who are interested, but also ask that guests respect their privacy as this is their full time residence. There is a gas station and a few restaurants 10 minutes west at Snoqualmie Pass (try Commonwealth, Dru Bru Brewery, Webb's Restaurant, Red Mountain Coffee Co, and the Armadillo cart). 10 minutes east in Easton there is a gas station and two restaurants (try Smokehouse BBQ). 22 minutes east is Suncadia (try Swiftwater Winery, Portals, or the Glade Springs Spa) and Roslyn is a great tiny town to check out with shops & restaurants (try Village Pizza, Maggie's Pantry, Pastime Burgers, Roslyn Brewery, and the Brick). 25 minutes east is Cle Elum with shops, gas, a grocery store, and restaurants (try Beau's Pizza/Pasta, Stella's Cafe, there is also a diner open until 1pm--Cottage Cafe). For construction season and the I-90 project: we have a separate, flat, 1 acre lot that is easily accessible from the main road. It would be well suited for long-term parking of vehicles and construction equipment. There is plenty of parking for multiple vehicles. However, after loading and unloading, vehicles must be parked at the far side of the parking lot, opposite the lodge. Garage doors must remain clear. Full stocked kitchen with a SubZero refrigerator, 1.5 oven and 6 burner Wolf range, large freezer, warming oven, and dishwasher. Access to locked pantry for long-term rentals. 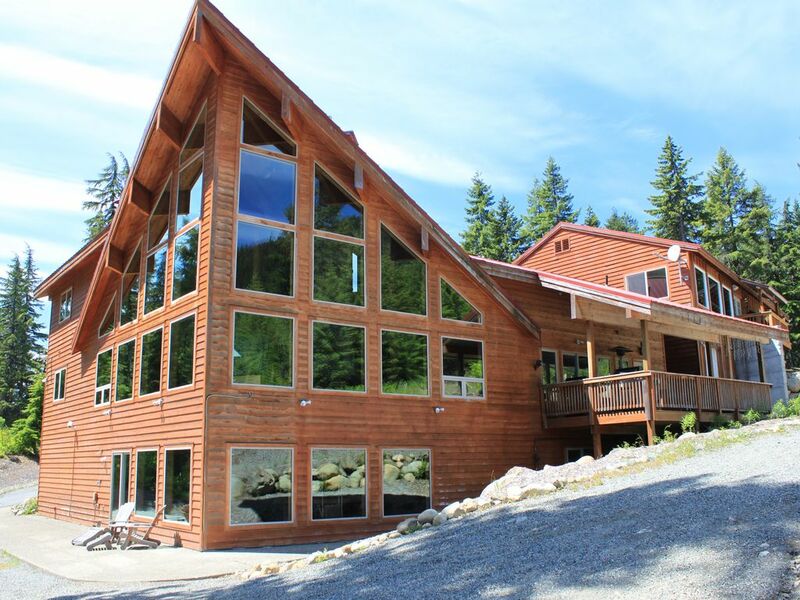 We are on 16 acres with total privacy from neighbors and bordering the Wenatchee National Forest, all just 5 minutes down the road from Lake Kachess and lots of hiking trails. Property managers live on site above a detached garage and are able to address concerns guests may have. Huge, beautiful, handsomely furnished, and well maintained. This place was great. We had 8 adults and 5 kids. More than enough room for everyone. The kids loved the game room (pool and air hockey). The beds were comfortable. The furniture and decore is in good shape, comfortable, and in good taste. Ten minute drive to skiing at the summit. We’d definitely stay here again. This is the third time my family has rented here. It is always clean and well stocked with everything you could need. It is a great location close to Cabin Creek ski area. Would highly recommend this rental. Great location! Amazing scenery! Easy to work with hosts!! It was our first friends and family New Year’s get together and we couldn’t have picked a better place to host it! This was a great home for our Women's Retreat. We enjoyed the kitchen and the hot tub ~ spent most of our time in the living room which was beautiful; snow falling was like we were in it ~ love the windows! A fine place, conducive to a relaxed time. Our group had a wonderful time at this property! It is so close to many fun activities, and the house is well appointed and very clean. The host was great, and was right on the property to help us with anything we needed. We would stay here again!! Rates are subject to change until reservation is confirmed. A violation of house rules and the rental contract may result in additional fees at the discretion of the home owner or property managers.